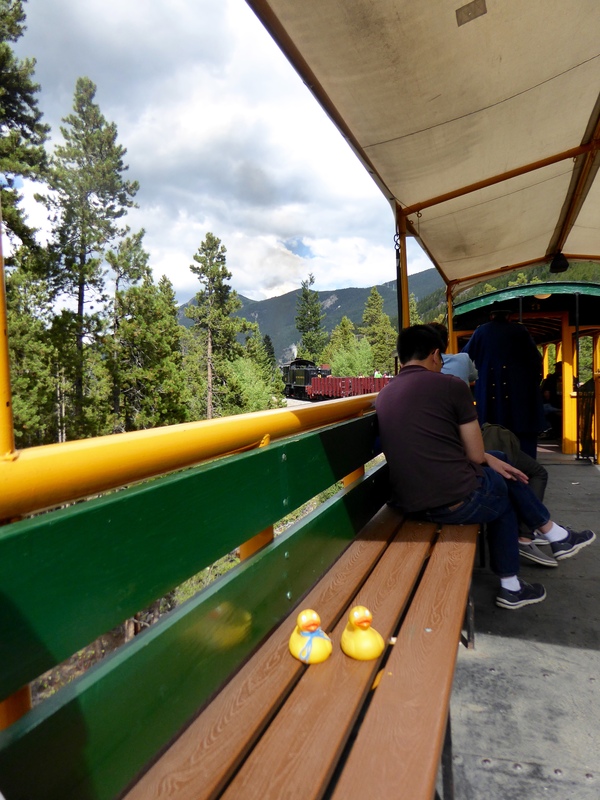 Soapy Smith Duck and I, Zeb the Duck, took our moms to Georgetown, Colorado to ride the narrow gauge train. We live about 40 minutes away and it was a beautiful, sunny Colorado day. 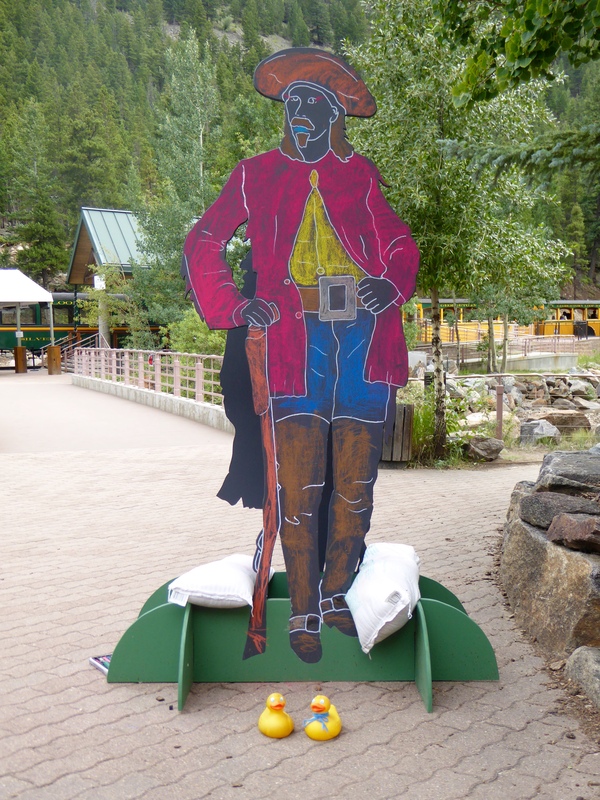 It was Buffalo Bill Days at the railroad. 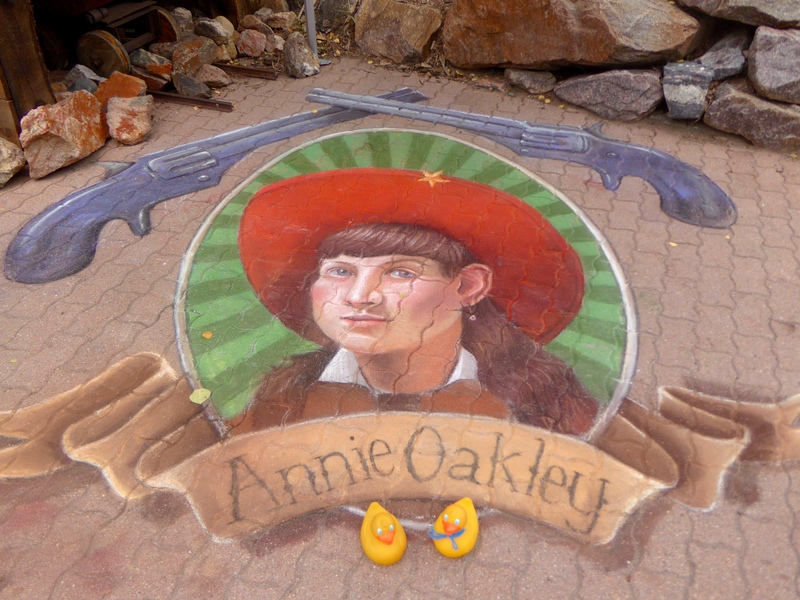 This is a great chalk picture of Annie Oakley. And, of course, here is a silhouette of Buffalo Bill. 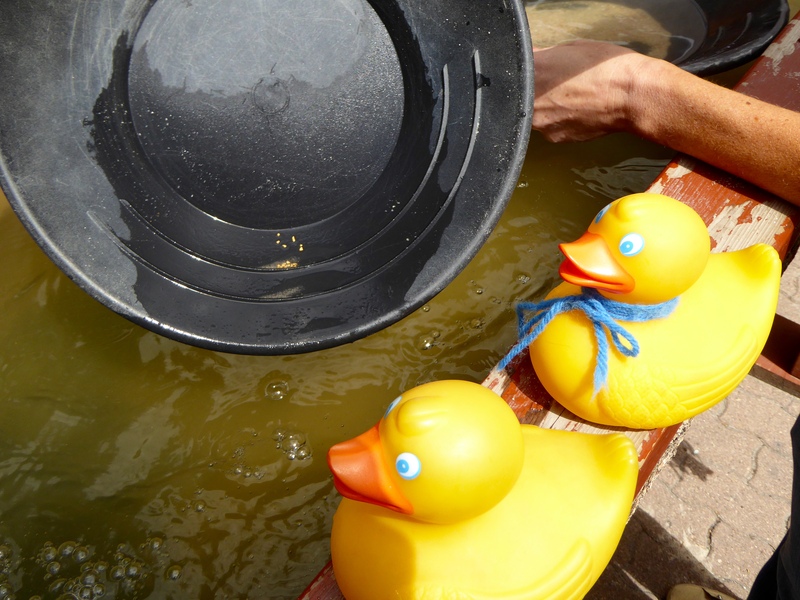 Jeff was there helping people pan for gold. 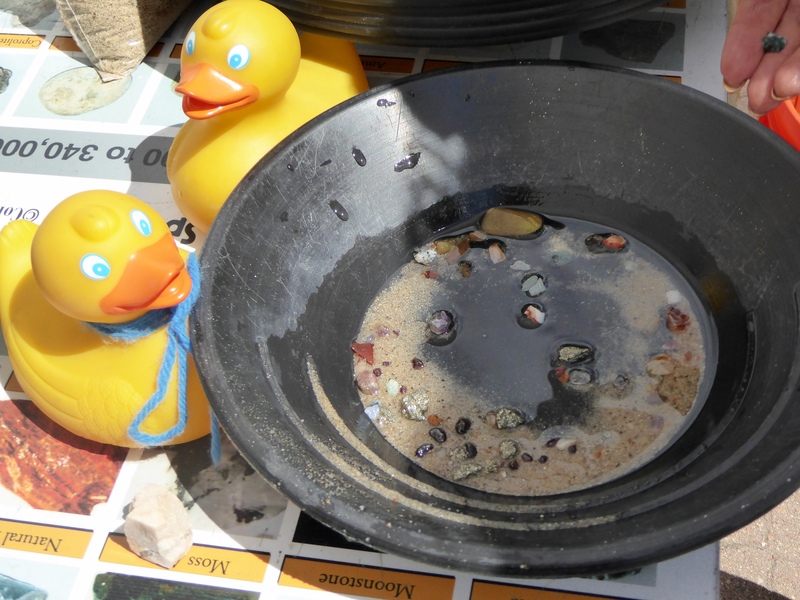 We are watching and helping Soapy’s mom with gold panning. Then she panned for gems. This is fun. 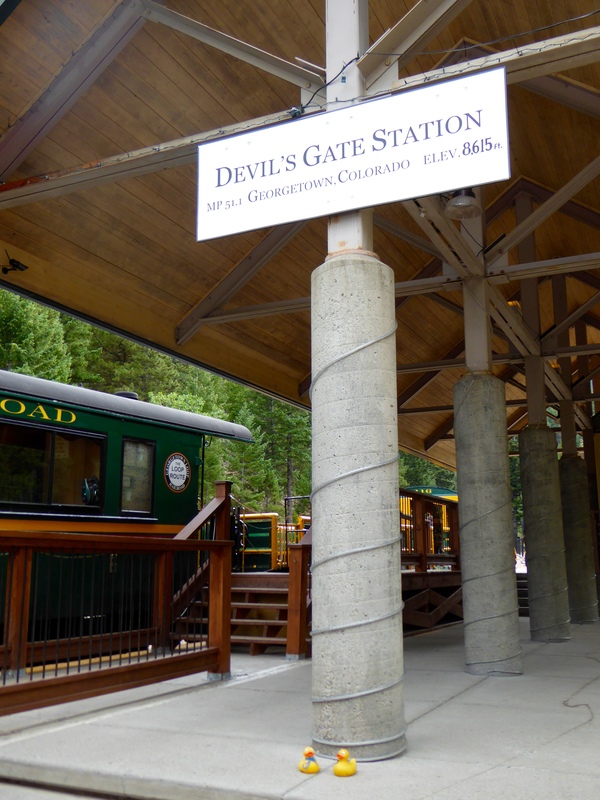 The Georgetown Loop Train leaves from Devil’s Gate Station in Georgetown. We like riding this train. When you drive in the mountains, the roads have switch backs, so you do not drive straight up. The train tracks do similar looping and turning, to reduce the uphill grade to about 4%. 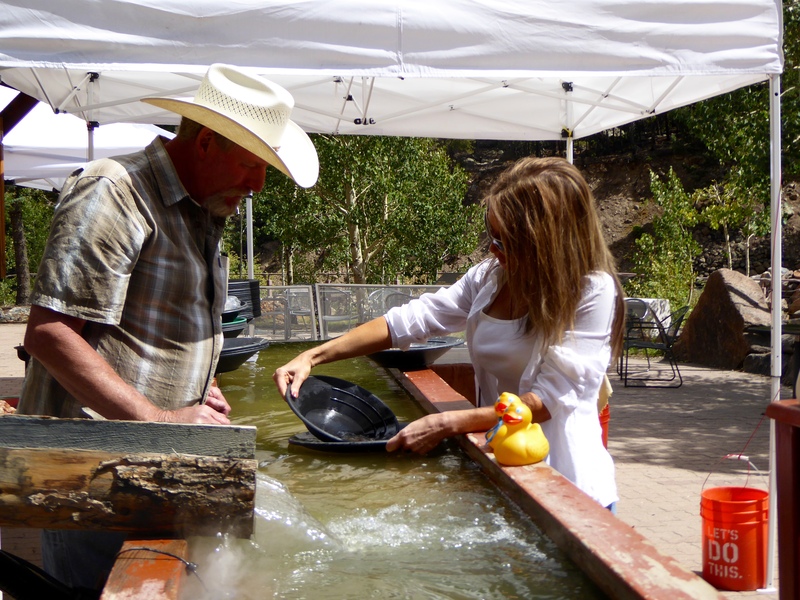 We will cross Clear Creek four times to arrive at Silver Plume. 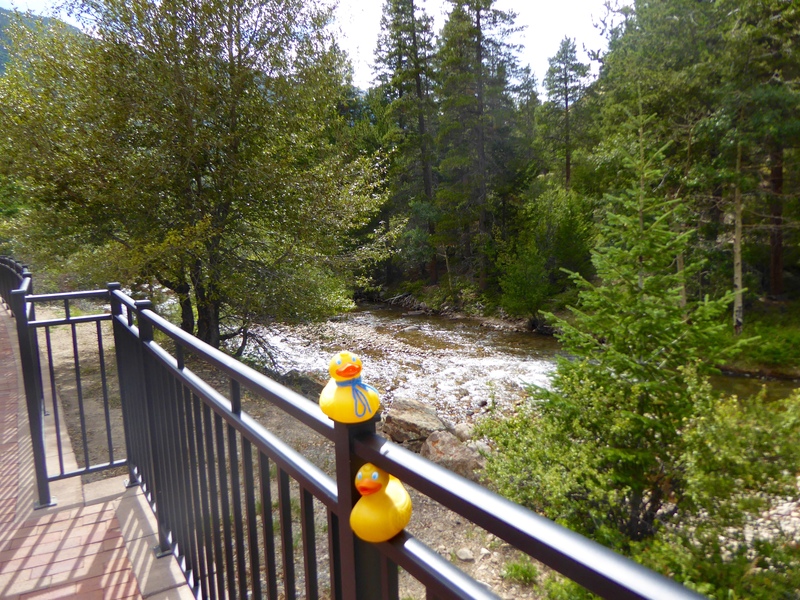 This is one of the bridges we will cross. 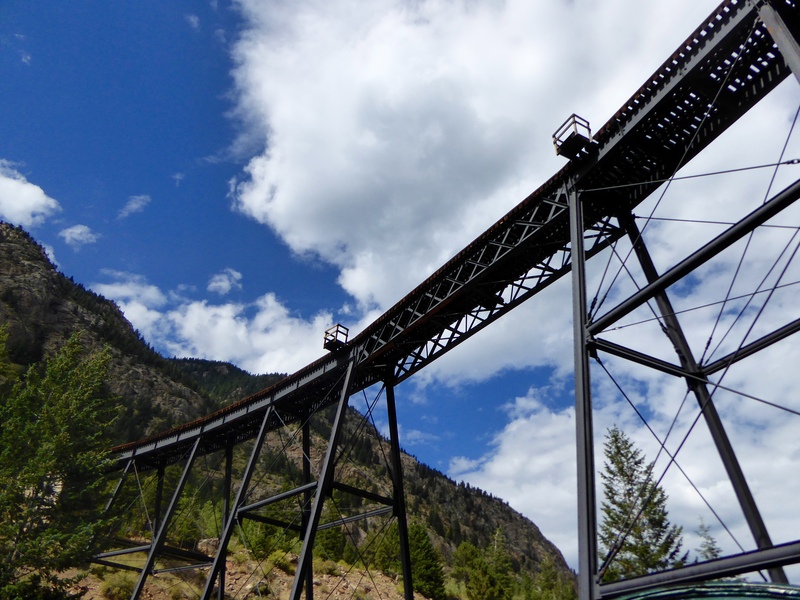 In the late 1800’s this was a great engineering accomplishment. Soapy’s mom with a wild west character. 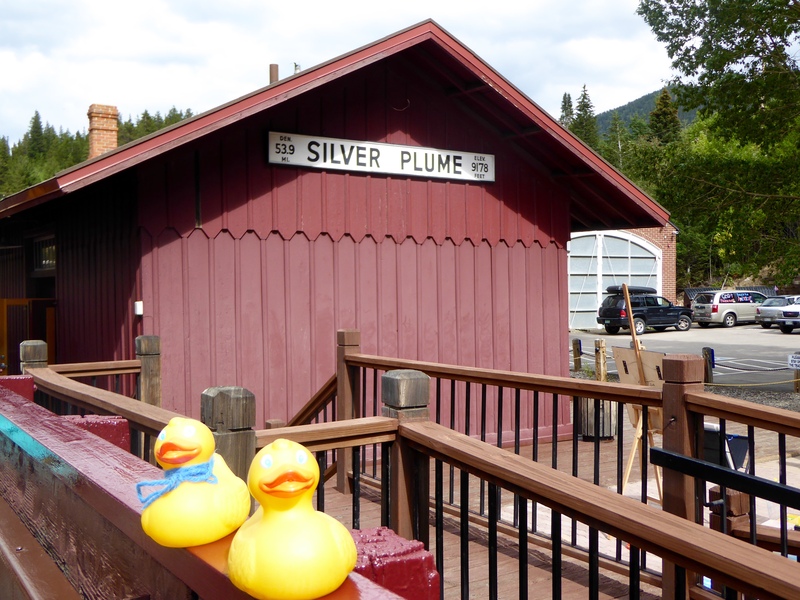 We arrived at Silver Plume station. Some passengers got off and others got on here. We got off for a few minutes to purchase snacks and then back on the train. 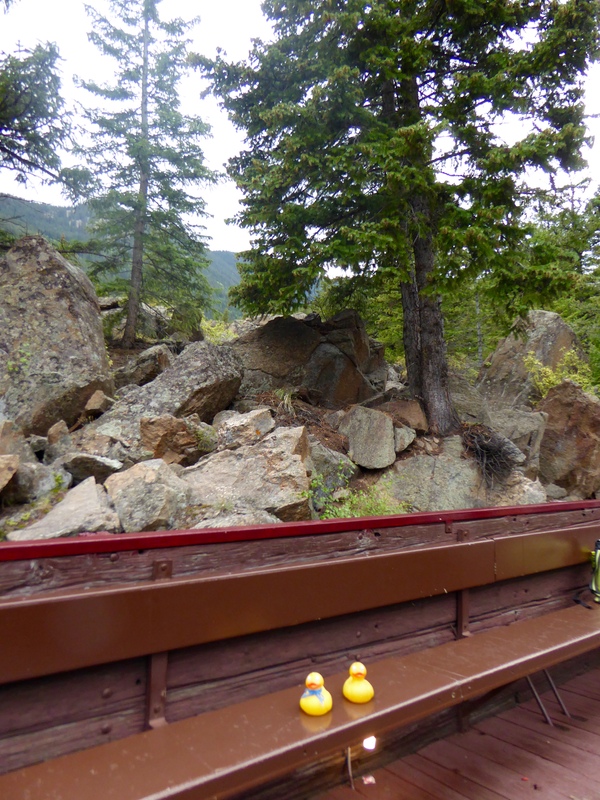 We love being in our Colorado Rocky Mountains. 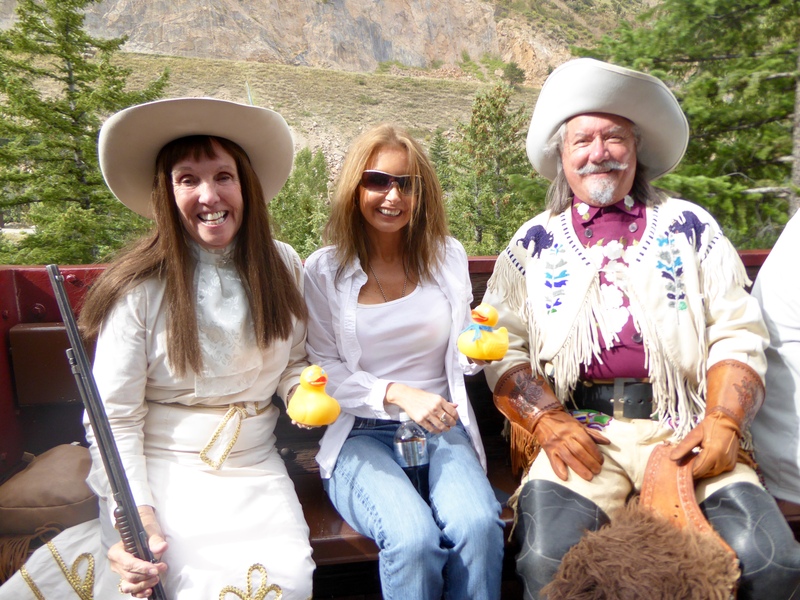 Now Buffalo Bill and Annie Oakley sit with Soapy, Zeb and Soapy’s mom. Here is another view of the front of our train. We are approaching Devil’s Gate Station, our starting and ending point. 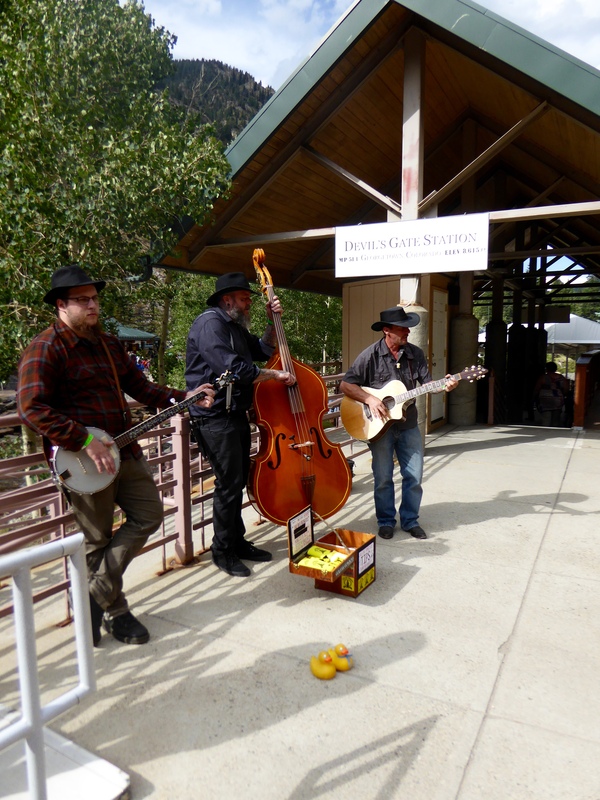 We liked these musicians, and they like the Colorado Traveling Ducks. 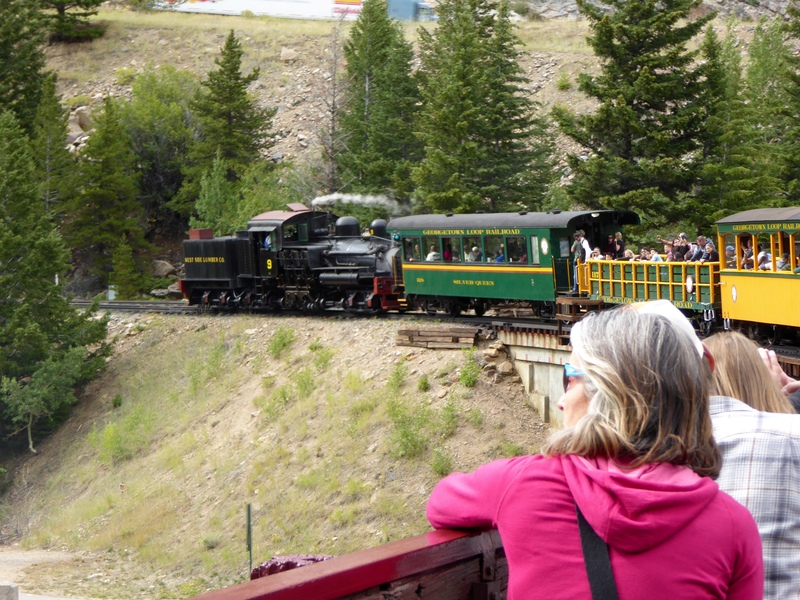 When you are in Colorado, we hope you ride this train or one of our other narrow gauge trains. Have fun and do some tourist things in your home town also. We had fun today. 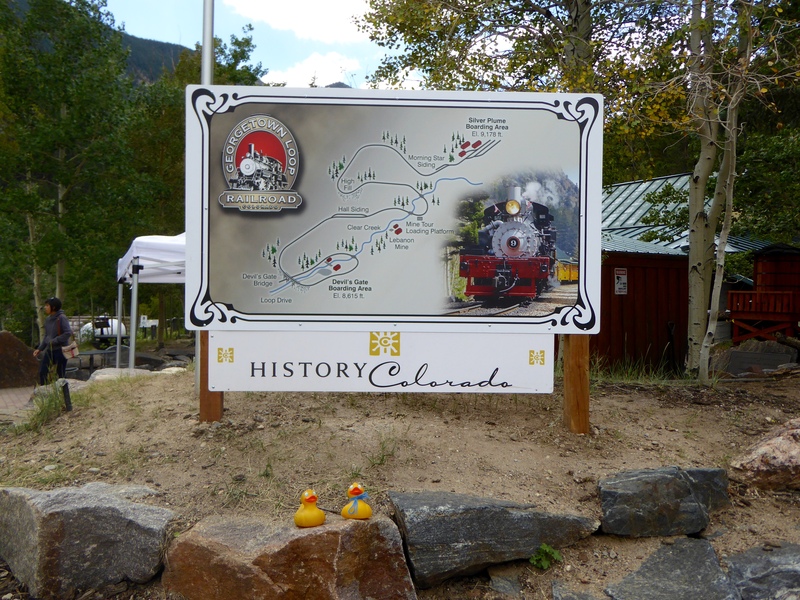 This entry was posted in Colorado, Uncategorized and tagged Annie Oakley, Buffalo Bill, Clear Creek, Colorado, Colorado Traveling Ducks, Georgetown, Georgetown Loop Train, gold panning, Silver Plume. Bookmark the permalink.